This is an elaborate octagonal compendium with many finely detailed features. The device includes a horizontal string gnomon sundial adjustable for latitude, wind vane, lunar volvelle, orthographic projection of the sphere and nocturnal. 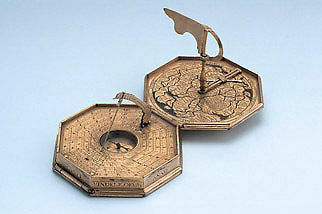 As well as such astronomical and time-telling functions, this instrument also presents cartographic material: it includes a geographical astrolabe and a map of central Europe.